Today, many venues, events and non-profit groups are seeking sponsors and many corporations are seeking sponsorship opportunities. Ncutt has created presentations for companies on both sides of the field helping many to connect. Ncutt can assist you whether you’re wanting to attract regional, national, or global attention. Starwood Ampitheatre, the largest outdoor venue in middle Tennessee, needed assistance in selling ticket packages to a corporate clientele. 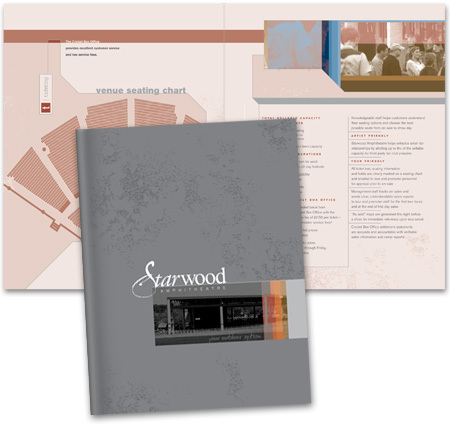 Ncutt designed a brochure that stated and visually clarified the programs Starwood had to offer. Along with ticket packages, enticing sponsorship opportunities were offered. creative value: Details matter. Inform your clients in an easy to follow guide — it's important.